Ever try to create a picture-in-picture video? It’s kind of a pain, what with the two video streams, the two audio streams, and the like. You can use iMovie on your Mac or iOS device, of course, but it requires some heavy lifting in the video editing department. Enter Eye Report, a sweet little video app that lets you take video with your rear iPhone or iPad camera and then film yourself with the front camera, putting it all together into one smooth picture in picture video, without any editing needed. Download Eye Report from the App Store for free, and launch it on your iPhone (or iPad with a camera) to start the process. If you want to record a video directly, tap the red circle Record button. Record the main video using the camera that faces away from you, and tap the red button again to stop recording. Then, tap the red Record button a second time, and a window in the upper right will show you the image from the camera that faces you. Typically, you’d put your talking head here. Record the second video, and then tap the Record button to end. 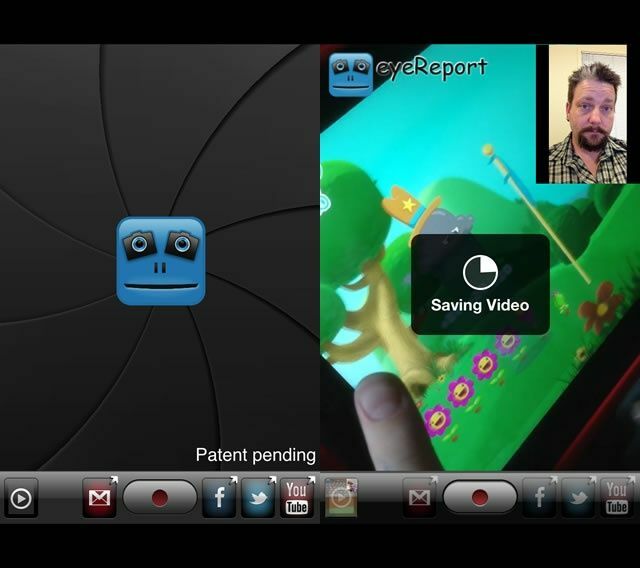 Eye Report will put the two video streams together, showing you a Saving Video timer in the center of the screen. If you want to use a video you’ve already taken tap the little circle with a right-facing triangle in it to the left there, and choose a video from your Camera Roll. Eye Report will compress the video down to work in the app, and you can then tap the red button to begin the front camera recording. Click the Home button and then tap the Photos icon to see your newly created picture-in-picture video. Tap the email, Facebook, Twitter, or YouTube buttons to share to those services.